Awesome dives today with Bandito Charters on the Ocean Quest. Captitan Gorge' Potts took the four of us (Aaron, Jesse and Michael) off to two of the best spots for Underwater Photography; Pt. Defiance North Wall and Zee's Reef. Michael and Jesse were trying out their new skills learned in the pool; like white balance, composition, lighting techniques and learning how to avoid the dreaded back-scatter. The first dive to the wall we set out to use natural light, and adjust the white balance to get more color in the shots. I followed suit with my Cannon D30 and Ikelite housing. I took along a new toy this dive to see if the hype was worth the money. I added a Green Magic Filter. Magic Filters are designed and made by Dr Alex Mustard. 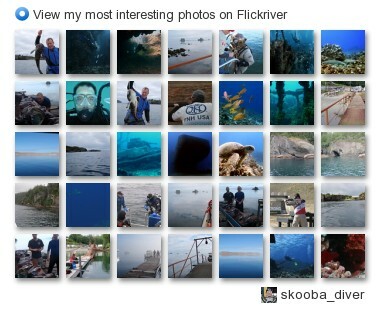 Photographers have been using the filters in blue water for a couple of years with great results. The new filter for green water just came out so I wanted to try it. The photos above were taken in natural light, the shot of Aaron was taken at 60' in the Pacific Northwest. You can see the red tint of the filter in the light from his Light Cannon, but the detail and color in the rest of the photo is great. 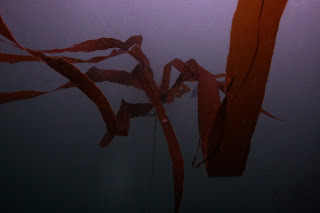 The kelp shot was taken at 30' without resetting the white balance; but it provides a neat mood. I would recommend the filters, and plan to show students how to use them in my next UW Photo class.